Jeans, Denim, Blue Jeans, whatever you call them – the bottom line is that they’re a staple in every man’s wardrobe. But that doesn’t mean most guys know how to choose the right pair. Every day, I see looks of dissapoinment slapped across people’s faces as the men in their lives waddle around in poopy-pants, flop about in the moo-moo version of jeans or show off their twig and berries. Every single man, no matter their size, age or body type should have a few pairs of dark washed jeans in their closet. 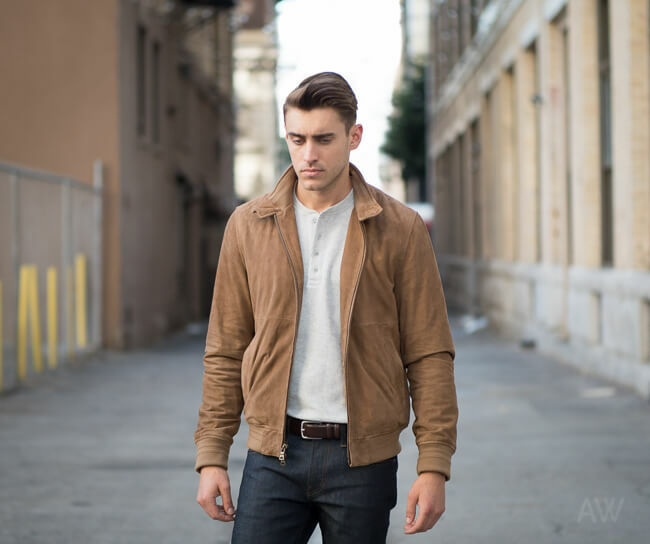 They work for nearly all occasions outside of a formal setting and look good with virtually everything- especially my list of men’s wardrobe essentials. They’ll never steer you wrong and are likely the pants you’ll wear a majority of the time. This dictates how light or dark the jeans are as well as how they’re treated. Light wash = lighter colored. Dark wash = dark. My preferred wash is dark blue, sometimes called indigo, depending on the brand. Because of the title of this article, you know I’m recommending that you own dark wash jeans. The reason is because this wash looks great on everybody, hides skinny or thicker legs better than any other color and can be dressed in a casual or less-casual way. I love them so much that I put them on every single one of my clients. The waist and inseam (leg length) measurements of the jeans. Ex: 32×32 (inches). They should fit your waist without needing a belt. They can even be slightly tight, as denim will loosen as you wear them. The inseam (length) should leave a slight or full break where they meet your shoes. Anything shorter will look odd and anything longer will bunch at your ankles and throw off your proportions. Denim material can be blended with a variety of other fabrics. Some jeans may have two to three percent spandex and others might have polyester blended into them. Spandex blends, while a little more comfortable and forgiving in the thighs, tend to stretch out and not retain their shape as well as 100% cotton blends. I’ve definitely seen some “poopy pants” as a result of this. It’ll depend on what you prefer, I can go either way on this – some of my recc’s below are blends, some are 100% cotton. They shouldn’t be too short or too long – having a slight or full break. Check out my Fit Guide for more in-depth info. A quick note about your height: It doesn’t matter. My clients range in size from 5ft 3in to almost 7ft and I’ve never put them in different jeans because of their height. These are the best jeans for short men, tall men, medium-sized men and so on. The only thing that matters is your build: slim/regular or larger. 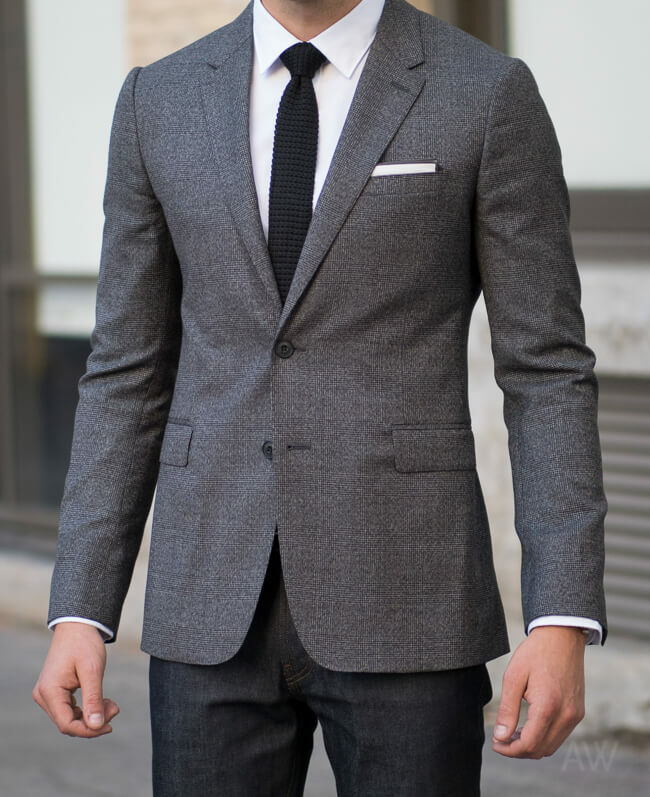 You’ll want to get a “Slim” fit. 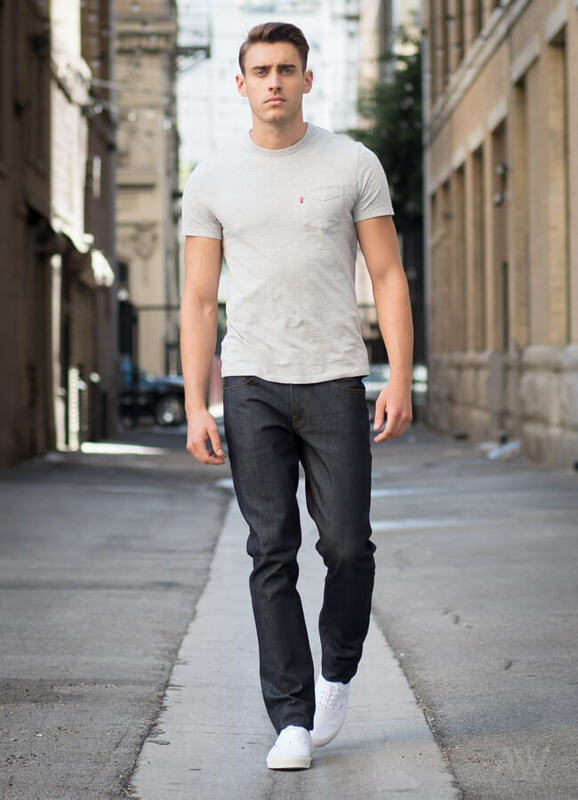 Slim-fit jeans tend to slightly hug the thighs, knees, and calves while tapering down from your knee to ankle. A lot of my slim & regular built clients initially believe this style will make them look too skinny. This couldn’t be further from the truth. It’s just that they’re used to wearing super baggier clothes to try and hide their slimness, which, coincidentally, just makes them look slimmer. A proper fitting pair of jeans just looks right, regardless of your build, and doesn’t make you look one way or another – I promise. Don’t make the mistake of thinking “Skinny” fit is the same as “Slim” fit. “Skinny” fit jeans are usually skin-tight and not appropriate. Avoid “Straight Fit” jeans. Like the name implies, the leg of the pants are looser and will be cut straight down from the knee to ankle. This cut will look terrible on you. If you can pinch more than an 1.5 inches of denim on either side of your thighs, you need to move down to a slimmer cut or get the legs taken in. If you can avoid it, don’t rush to the tailor. Try a size down first or another brand. This is costly for a tailor to do. Having too much fabric on your thighs will make you look smaller, shorter or wider than you are. I’ve personally worked with and touched each pair of these jeans (in all sections) and they’re awesome. The fit is very accurate, the pocket placement and stitching is great. Diesel runs a little larger in the waist, so go down a size (ex: if you’re a 34 waist, get a 32). I love these because the quality in relation to the price is very good and you can never go wrong with a classic like Levi’s and I love Uniqlo’s wash and they also offer free hemming! The classic “Straight-Leg” fit is perfect for you. 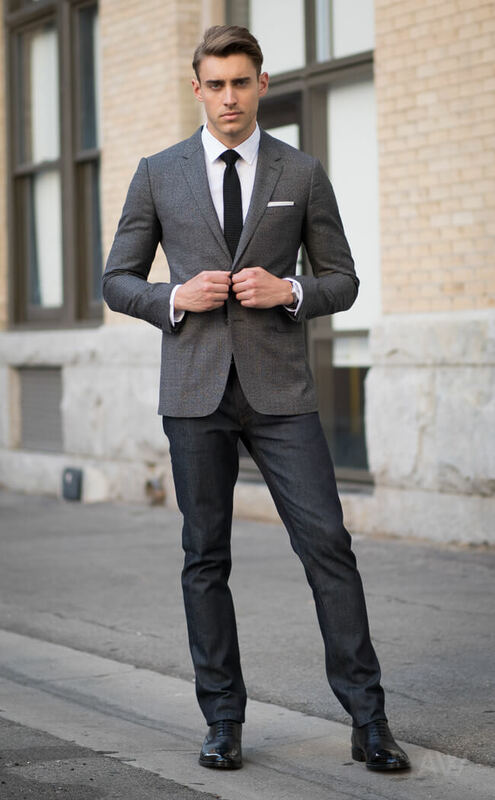 No matter a man’s build, but especially in your case, it’s all about balancing your body’s proportions to make sure your bottom half complements your upper half. 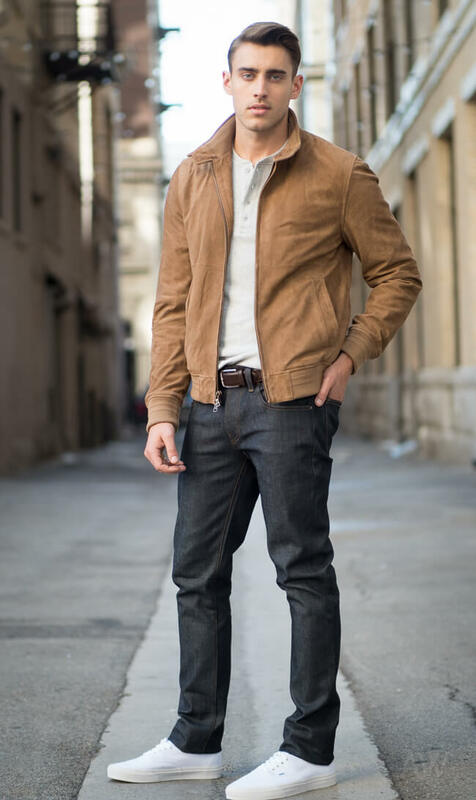 There are a few great brands out there that offer straight-legged jeans with a slightly roomier thigh area which will hopefully solve your frustrations with finding jeans that fit properly. Avoid any cut of jean (all pants in general, for your build) with a taper in the legs. A taper will make you look really top heavy. If you can pinch more than an 1.5 inches of denim on either side of your thighs, you need to move down a size, go to a slimmer cut, try a different brand, or get the legs taken in by a tailor. Don’t get the legs taken in if you can help it, it’s costly for a tailor to do. Having too much fabric on your thighs will make you look wider than you are and completely throw off your proportions. The wash, quality and fit of these are great and I use them all the time for my larger clients because it makes them look really sharp. Just like I said for the slim to regular built options in this category: I love these because the quality in relation to the price is very good and you can never go wrong with a classic like Levi’s and Uniqlo’s wash is great and they offer free hemming!